I had to swerve to miss them! 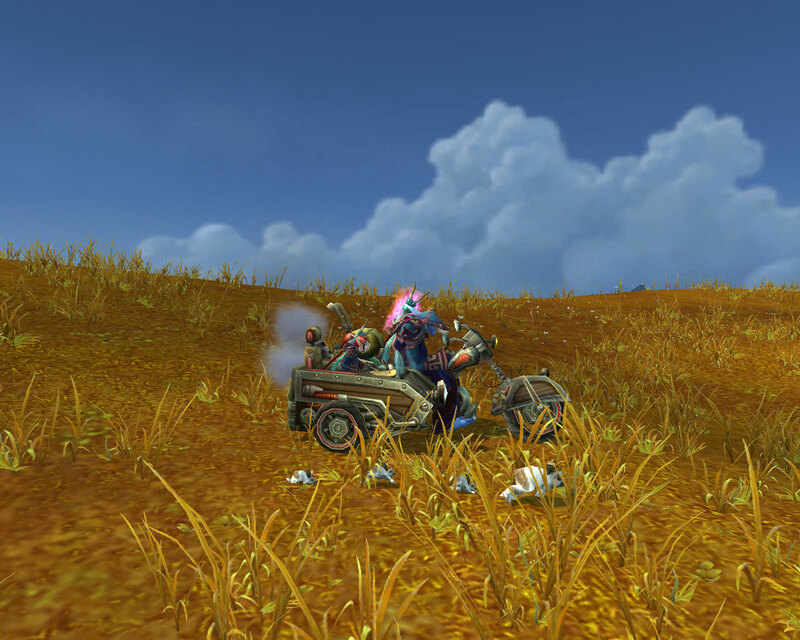 I need a sidecar on the other side – one for my blood elf lady and one for my pandaren lady. Happy early Thanksgiving! While I enjoy writing about World of Warcraft (and occasionally other MMOs) here, I won’t have much to write about for the next week. That tends to happen when you go on vacation to Hawaii! Feel free to enjoy a few screenshots I have scheduled in my absence. I had to snap a shot of this cute yak as I saved him from the cave! I like getting new gear, and I like knowing what gear I need. Specifically, I like knowing what bosses, dungeons, or raid bosses I no longer need to worry about. Back in 3.3, I reached a point where I was very rarely seeing anything drop that I needed. This was when I decided to start tracking gear upgrades. Because I wanted to complete Loremaster of Pandaria, running dungeons only once I reached them in a story, I didn’t really need to worry about gear until I finished questing. 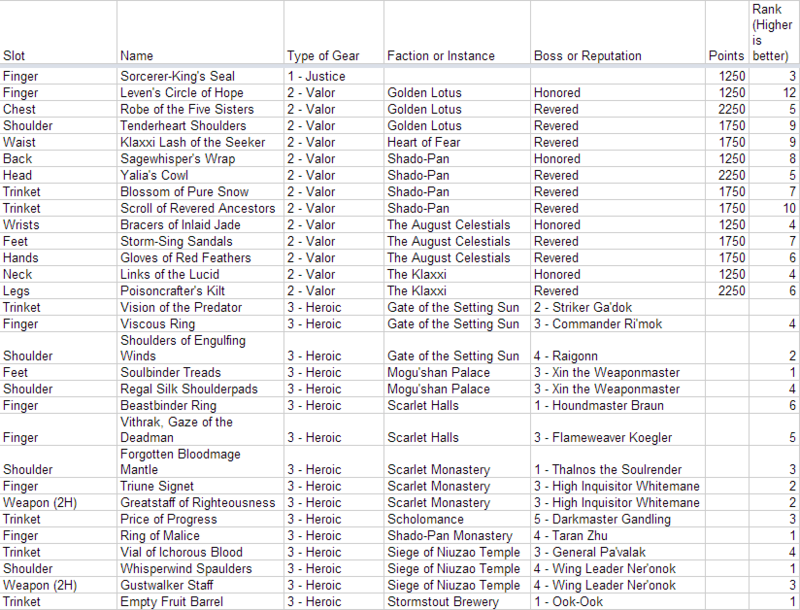 That happened on the 4th, and I quickly made this spreadsheet. By the 10th, about one week later, my item level was high enough to queue for LFR. While I’ve run every instance, I actually haven’t run every heroic. I keep queuing for random heroics, but I haven’t been given heroic Shado-pan Monastery yet. That doesn’t bother me; it’s just an observation. I’ve completed the LFR of Mogu’shan Vaults and am hoping to be able to continue in LFR soon. There are some areas that I’ve barely touched. For one, I haven’t PVP’d much. When I don’t need to run heroics so much, then I can run battlegrounds. I’ve only done one scenario. Again, I’ll do that later. Dailies are something that I really need to tackle more. I’m focusing on the Klaxxi first, but I’ve only spent a few days on them really. Lost!, Chris Pearson, Confessions of a Grown-Up Gamer, 11/14/12. WoW let Chris know that he was in the wrong zone. Unfortunately, it didn’t elaborate. 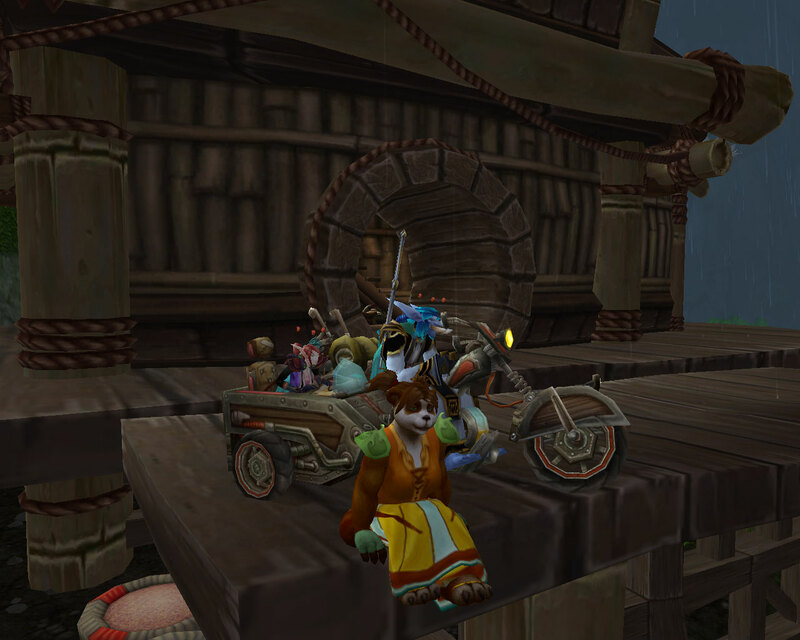 How Mists of Pandaria represents a new era of WoW content. 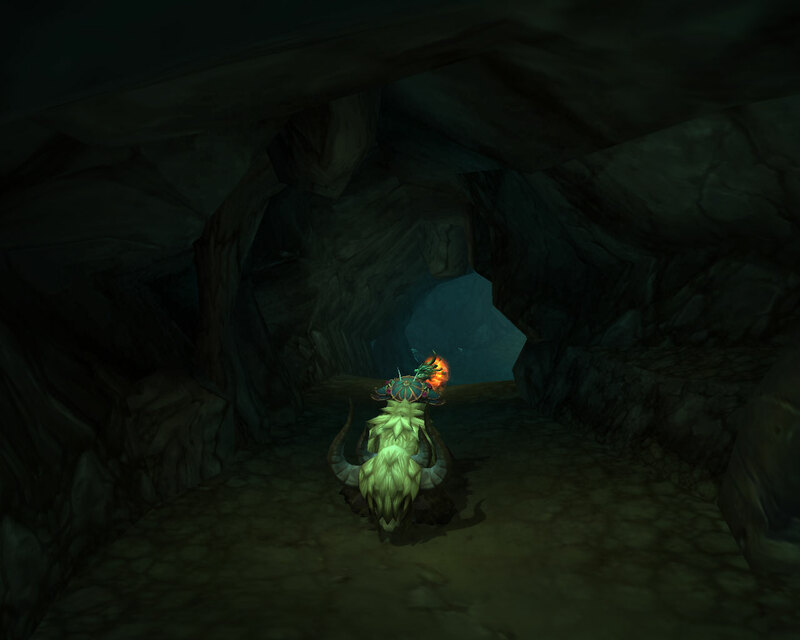 Know Your Lore: Dailies and story development, Anne Stickney, WoW Insider, 11/11/12. A look at how story progression and dailies have changed. Know Your Lore: The mysteries of the pandaren, Matthew Rossi, WoW Insider, 11/14/12. What do we know about the pandaren? More importantly, what don’t we know? A thought about the Brawlers Guild, TyphoonAndrew, TyphoonAndrew’s – Eye of the Storm, 11/10/12. Why do you fight in the Brawler’s Guild? To fight. Brawlers Guild Invitations, Rohan, Blessing of Kings, 11/9/12. Rohan explains the Brawler’s Guild and gives some alternate ideas for inviting players to join. Blizzard Talks about Brawler’s Guild, Olivia Grace, WoW Insider, 11/8/12. Blizzard responds to questions and feedback about the Brawler’s Guild.